This is an eclectic selection of Blues, Latin, Rock & Roll and even a Psycho-country tune performed by top San Francisco Musicians live at Lou's Pier 47 blues venue in San Francisco's famed Fisherman's Wharf. It doesn't get better than this. You don't get much more San Francisco and much more live than this CD by OUT-FRONT. It was recorded live at Lou's Pier 47 down at Fisherman's Wharf in San Franciso. You can almost smell the lobster bubbling in the big aluminum pots and you can hear the "Bush Man" jumping out from his hiding place behind some fake bushes to scare the living daylights out of a tourist who is wondering why everyone is staring at them. They soon find out! As you walk down the 300 block of Jefferson Ave. on this beautiful Saturday you hear fantastic Blues wafting out in the breeze. You look up and your standing in front of Lou's Pier 47 Blues Club. Every famous blues musician from Sacramento to Monterey has played there. You go upstairs and listen. If this day happened to be July 6 2006 between twelve and three this is what you heard. And... this CD is so live that you can hear motorcyles and police sirens in the background during quiet parts as Marlon Green plays one of his famous "anything is a drum" solos. You hear Derek Evans belting out a Ray Charles tune with Russ Whitehead's "200 watt" bass lines. You experience the key- board talent of Roscoe Gallo and the fantastic guitar playing of Mike Shapiro. 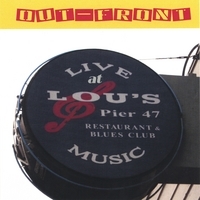 Join us at Lou's today and listen to the sounds of San Francisco Blues today with OUT-FRONT.